Senior year can be an extremely stressful year. In order to be successful, I suggest that you plan appropriately. If you need assistance in coming up with a plan, I am willing to assist you, but you need to ask for help. It is imperative that you check this website and remind regularly to make sure you are staying on track to achieve greatness. Hopefully you completed your summer homework as that will make senior year less stressful. Please check on the application page to work on your applications. Make sure you save your information so you can go back to your applications at any time. It is important that you DO NOT submit your application without it being checked by Mrs. Bartsch first. If you submit without it being checked you may make mistakes. Once you are ready to submit your application please make an appointment with me to submit. Here is a guide to the college admissions process. Check the scholarship page to find scholarships that you may qualify for. Seniors please make sure you have created your Parchment account and you are ordering your transcripts if schools are asking for them. You should be checking your portals on a daily basis as schools will be asking for a lot of information. Once you receive information from your school you need to make sure you are providing what they ask for. Pay attention to creating your portals and the information they are stating you need to complete your college application information. 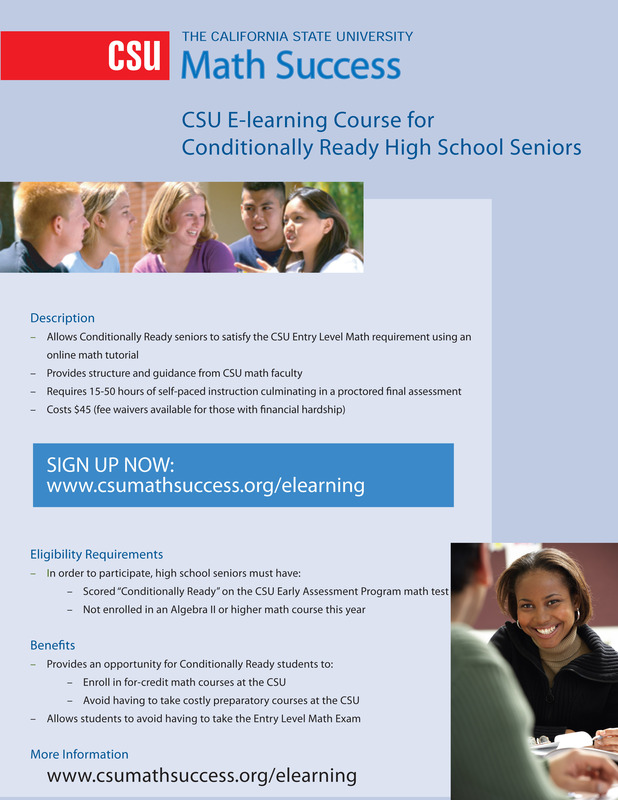 If you conditionally ready letter regarding math, check out the CSU Math Success course being offered and learn more. Are you ready for college? Check out this booklet to give you information regarding EAP information and what you need to know. Students if you need to sign up for the placement tests (ELM/EPT) please see the available dates and make sure you are adhering to the timelines requested by your school! When it comes time you will complete your FAFSA. In order to be ready you are going to need a FAFSA ID for both you and your parents. This is different than in previous years, previously you were required to have a PIN number, now you are required to have a FAFSA ID. In order to receive one you will need a valid email address, as will your parent. Your email and the one your parents use may not be the same. If your parents do not have an email address please assist them in setting one up so you can be ready with your ID. If you have questions please see Mrs. Bartsch. She will be coming into your AVID elective class to assist with this process. Once you have filed your FAFSA you will need to sign up for your webgrants account. Follow the information and make sure you keep track as this will be your way to track your CalGrant information. If you have questions regarding which parent should be submitting information for the FAFSA or CSS Profile you may want to check out this resource or speak to your counselor. Here is a great read on common FAFSA mistakes. 5 facts about CSU financial aid. Sign up for your Cal Grant account. If you have questions please see Mrs. Bartsch. So you have made your decision, what's next?